ABU DHABI- ADCB announced net profit for the first 3 months of 2007 of AED 470 million against AED 623 million for the same period last year, after adjusting for the initial public offering revenue in 2006, first quarter profits have increased by 35 %. Core operating profit for the first quarter of 2007 has risen to AED 717 million, a 24% increase over 2006. 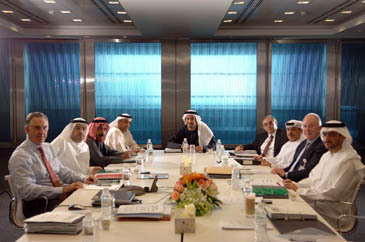 Total assets also increased by 8% from AED 81.1 billion to AED 87.9 billion during the first 3 months of 2007. Deposits have grown by 14.4% to AED 49.7 billion from AED 43.4 billion for the same period last year. Loans and advances have also increased by 1.87% to AED 64.3 billion from AED 62.4 billion at the end of 2006. Saeed Al Hajeri, Chairman of ADCB, said ‘Our core Businesses are experiencing continued high growth. The Bank is successfully implementing its core Business Strategic Plan in the fields of wealth management, commercial banking, portfolio investments, corporate finance and retail banking which continued to produce excellent results. "The effectiveness of this strategy combined with excellent operating performance, is clearly evident in the sharp rise of the Bank's first quarter core profit," the Chairman concluded. Eirvin Knox, Chief Executive Officer of ADCB added that, "this significant growth in first quarter earnings is the result of continuing strong loan demand and the closing of several large deals in Abu Dhabi and Dubai for infrastructure and other large projects in recent months." Meethaq Mudarabah Overdraft Facility, Family Protector Plan 2 from Bancassurance and relaunched the Meethaq Takaful & Savings Programme. The first quarter also witnessed the launch of important campaigns such as Excellency Double Advantage Campaign and Investments Double Advantage Campaign. . In the first quarter, ADCB was recognised as the "Most Improved Islamic bank in the Middle East" by the pre-eminent international financial magazine Euromoney at the 5th Annual Euromoney Islamic Finance Awards 2007 in London on January 30th. Furthermore ADCB's Meethaq Mudaraba overdraft facility was recognised as "New Product of the Year" making it the most innovative Shariah compliant product to be launched anywhere in the world in 2006, Knox added. ADCB launched a $1 billion syndicated loan in the first quarter of 2007 that was heavely over subscribed and closed at $1.5 billion from 35 international banks to support the expected continuing loan growth. This was the largest syndicated loan over done in the Middle East and achieved record low pricing of Libor +25 basis points. Commenting further on the highly successful loan, Knox said, "this is again a strong signal from international markets that ADCB continues as one of the strongest and most effective banks in the region. Again we set new bench marks for size and pricing for banks in the region"
Another fitting tribute from one of the world's most prestigious fund awards came for Al Basha'er Fund, this Shari'ah Compliant investment opportunity designed to offer access to a vibrant market which has truly made its mark attracting the "Best Islamic GCC Equity Fund 2007" among Lipper Fund Awards 2007. Abu Dhabi Commercial Bank — ADCB is a diversified full service bank. Other than banking services that span corporate, retail and commercial banking ADCB is active in the areas of treasury derivatives, infrastructure finance, private banking and wealth management. Since 1985, ADCB has reported successive years of record profits and consistent growth. Our approach is driven by the ability to create value for our customers by leveraging our skills and expertise. Amongst UAE banks, ADCB has the second largest deposit base with total assets as at 31/03/2007 of AED 87.9 billion and net profit for the first quarter of 2007 at AED 470 million. Our strong franchise, supported by a network of 42 branches in UAE and 2 branches in India is reflected in our recent rating of Aa3, which is the highest awarded to a bank in the Middle East.